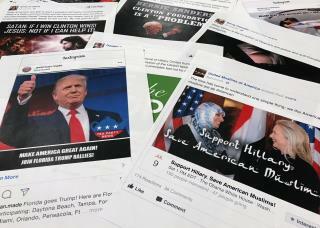 (Newser) – What's "dead clear": Propaganda pushers have been using platforms like Google, Facebook, and Twitter "exactly as they were designed to be used." What we're just now learning: that those companies were more or less useless on the front lines against disinformation and "fake news," and that now "we're on our own." That's per tech journalist Kara Swisher, who writes in an op-ed for the New York Times that there's a "high-stakes information war" being waged, including by Russian trolls, and the "foot-dragging tech giants" haven't been pulling their weight in fighting against it, claiming they didn't fully know what was going on both as it was happening and even after things seemed to be pointing toward nefarious uses of their platforms. First, if you pay nothing to join a product offering, you are the product and your information will be shared with anyone paying for it. We need to wean ourselves of social media and do more family and church activities. "hose companies were more or less useless on the front lines against disinformation and "fake news,"" Unless they learn how to set aside their biases, these companies will never be useful against disinformation. Easy enough: If a Leftist says it, it is Wrong, and can be ignored.